A rapid, one step test for the qualitative detection of Opiates in human urine. For healthcare professionals including professionals at point of care sites. For in vitro diagnostic use only. Single use Morphine / heroin urine dip drug test. 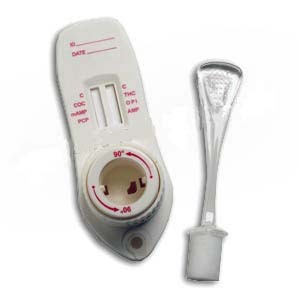 The MOP One Step Opiate Test Strip is a rapid urine screening test that can be performed without the use of an instrument. The test utilizes a monoclonal antibody to selectively detect levels of morphine in urine. This One Step Opiate / Morphine Test Strip yields a positive result when the morphine in urine exceeds 300 ng/mL. #DIP-401 - Four panel drug test dip that will test for Methamphetamine, Opiates, Cocaine and Marijuana in one test. The MOP One Step Opiate Test Strip is a lateral flow chromatographic immunoassay for the detection of opiates in urine at a cut-off concentration of 300 ng/mL. This test will detect other opiates. Please refer to analytical specificity table in this package insert. The MOP One Step Opiate Test Strip is a rapid urine screening test that can be performed without the use of an instrument. The test utilizes a monoclonal antibody to selectively detect elevated levels of opiates in urine. The MOP One Step Opiate Test Strip yields a positive result when the concentration of opiate exceeds the 300 cutoff level. The MOP One Step Opiate Test Strip is an immunoassay based on the principle of competitive binding. Drugs which may be present in the urine specimen compete against the drug conjugate for binding sites on the antibody. During testing, a urine specimen migrates upward by capillary action. Opiates, if present in the urine specimen below the cutoff concentration, will not saturate the binding sites of the antibody in the test strip. The morphine conjugate will be captured by antibody and a visible colored line will show up in the test line region. The colored line will not form in the test line region if the opiates level exceeds the cutoff concentration because it will saturate all the binding sites of anti-morphine antibodies. A drug-positive urine specimen will not generate a colored line in the test line region because of drug competition, while a drug-negative urine specimen will generate a line in the test line region because of the absence of drug competition. To serve as a procedural control, a colored line will always appear at the control line region, indicating that proper volume of specimen has been added and membrane wicking has occurred. The test strip contains monoclonal anti-morphine antibody-coupled particles and morphineprotein conjugates. A goat antibody is employed in the control line system. The test strip should remain in the sealed pouch until use. The used test strip should be discarded according to federal, state and local regulations. Store as packaged in the sealed pouch at 2-30°C. The test strip is stable through the expiration date printed on the sealed pouch. The test strips must remain in the sealed pouch until use. DO NOT FREEZE. Do not use beyond the expiration date. Eighty (80) of these samples were also run using the MOP One Step Opiate Test Strip by an untrained operator at a different site. Based on GC/MS data, the operator obtained a statistically similar Positive Agreement, Negative Agreement and Overall Agreement rate as the laboratory personnel. The following table lists compounds that are positively detected in urine by the MOP One Step Opiate Test Strip at 5 minutes. Fifteen (15) urine samples of normal, high, and low specific gravity ranges were spiked with 150 ng/ml and 450 ng/ml of Morphine respectively. The MOP One Step Opiate Test Strip was tested in duplicate using the fifteen neat and spiked urine samples. The results demonstrate that varying ranges of urinary specific gravity does not affect the test results. The pH of an aliquoted negative urine pool was adjusted to a pH range of 5 to 9 in 1 pH unit increments and spiked with Morphine to 150 ng/ml and 450 ng/ml. The spiked, pHadjusted urine was tested with the MOP One Step Opiate Test Strip in duplicate and interpreted according to the package insert. The results demonstrate that varying ranges of pH does not interfere with the performance of the test.